Description: An Azalea with a robust and upright habit. Deep green foliage with heavy flowering in autumn and spring, and regular flowering in summer. 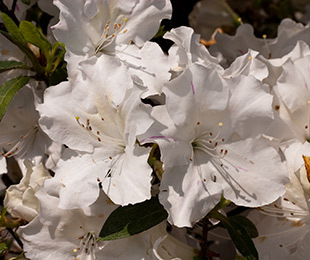 It has single white blooms with occasional single purple stripes. 50mm in diameter and holding well on the plant. Attracts butterflies. Size: 1.25m high x 1m wide. Uses: Ideal for specimen planting, mass planting and in gardens and borders. Position: Full sun to part shade. Tolerates frost and moderate drought (as the plant matures it becomes more drought tolerant). Prefers well drained soils. Care: Water well for the first year for the plant to fully establish and become more drought tolerant. Top up water in dry periods. Plant in a well mulched garden (chunky mulch is recommended) with the root ball slightly above soil level. If required use slow release fertiliser in spring. For best results prune after spring flowering. Where it works: QLD, NSW, ACT, VIC, TAS, SA & WA. This website gives general information for the states/regions in Australia. For local information on which plants work in your area contact your local grower. Local grower knowledge is vital, this website is no substitute. Heights shown on the website are for general gardening conditions. In well maintained gardens, some plants will get taller. For retail nurseries and more wholesale growers click here. IMPORTANT FACT ABOUT PLANT & TURF NAMES: In this website, the genus species and cultivar are listed like this example: Dianella caerulea ‘DCNC0’ is the PBR and cultivar name. The brand name or trade name for this plant is BREEZE®, and should not be confused with the true cultivar name. The cultivar or true plant or turf name will always immediately follow the species name enclosed in single quotation marks. DISCLAIMER: This website is copyright. Apart from any fair dealing for the purpose of private study, research, criticism or review as permitted under the Copyright Act, no part may be reproduced by any process without written permission, except for 3D graphics for the purpose of using in CAD software and the downloadable photos for the purpose of showing clients images. Ozbreed believes all the information supplied in this website to be correct at time of publication. They are not, however, in a position to make a guarantee to this effect and accepts no liability in the event of any information proving inaccurate or photo colours being incorrect or cannot be held responsible for plants dying for any reason. Plants are living things and no matter how careful they are used, they sometimes die. Use these plants understanding that no compensation can be claimed from Ozbreed for any loss.